The spring has not yet come here in Western New York but She is definitely trying to manifest. Our weather has been swinging from frigid cold to above 40 degrees making it hard to settle into the historic rhythm that we are used to. When I lived in Harrisburg, PA, March and April were warmer months. Snow was almost unheard of at this time of year. Since I moved into the Buffalo area, my experience of the weather has shifted. Ostara, or the vernal equinox, occurs this year on March 20 at 5:58 p.m. As the wheel has turned, the energies of the Earth Mother will start flowing. In my mind, I turn again to Uruz and the vitality of nature. Ostara marks the celebration of the earth warming up beneath the snow. Snowdrops poke their tiny heads out of the soil and act as a quiet reminder of the life that is to come. This spring, slow down. Watch the birds, and pay attention to the changes. All too often I feel that we try to rush ahead into summer, looking for freedom from the chill. Not me, not this time. I will be watching the signs of Nature and staying aware of the changing features of Mother Earth. What will She be wearing tomorrow? I once told a student that Perfect Love and Perfect Trust is when you stand in a circle with a bunch of people, blind-folded and naked, and you know that one of them has a knife… but you trust that not one of them will hurt you. But this is only a portion of what the phrase Perfect Love and Perfect Trust means in the Craft. No matter where you go or what you do, people will lie to you. They will lie either to make themselves look better in your eyes or to serve some sort of agenda. Regardless of their personal rationale, this is not someone you should trust… in a circle… blind-folded and naked… with a knife. Too often we want our friend back, so we are willing to turn a blind eye to their betrayal and their further deceptive patterns. However, this often and usually bites us in the bum time and again. Then we spend too much time either being angry at them for their betrayal or tearing ourselves down for our stupidity in trusting them again. “But, Lady Kaltem, people can change!” Of course they can. Witches do it every single day. However, once someone betrays your trust, how do you ever trust them again? By watching their future patterns for years. Did you catch that? Years. That’s how long it takes to gain someone’s complete trust back. Can you imagine standing naked in a circle*, blind-folded or not, with someone you do not trust for years? This is the 21st century, and many witches are still in the broom closet. This makes Perfect Trust more important than ever. It is so difficult to find a coven that you resonate with energetically, and one lie—no matter the “size” or the reason—can destroy the Trust of the coven and thereby the flow of energy during a group working. * Please note: The Knotted Ash Tradition does not maintain a standard of skyclad practice. Our members are free to practice as they wish in their own homes, but as a whole, we require that all participants in our group rituals be clothed. Occasionally, someone on the Paths reaches out to those of another line, tradition, etc. They may do this for any number of reasons. Ultimately, any ethical teacher will eventually ask if that person has sworn any oaths. When that question comes will vary by the situation. 1. An Oath is a pledge sworn before one's people and one's Divine source that has inherent within it a suspended curse. So we respectfully interact with someone who has sworn an Oath to others with that in mind. 2. Oaths sworn to a coven, grove, hearth, harrow, and so forth bind the individual into that group's egregore (collective mind). Someone choosing to leave a group for any reason will need time to dissolve those bonds, if possible over time, so that any practice with a new group is not unduly affected by that person's prior relationships. Not all spiritual/occult/magickal/Craft groups have such concerns with their membership. But some DO. This Clan does NOT recruit members from the public at large and likewise does NOT engage in "coven raiding" (verb. meaning recruiting candidates from other groups). Coven raiding can only bring disharmony at best and will harm the recruited person in any case. We find friendships within our community at large to be far more beneficial as well as honoring of the Paths we all walk. Honoring the loyalties of others is one of our Tradition's highest values. Whether they be your ancestors of the Craft, your ancestors of your blood, or your ancestors of your people ... they will speak, if you will but listen. Sometimes with voices strong and bold, sometimes with mere whispers ... they will speak, if you will but listen. When you ask them or your Gods and Goddesses for help, for change, for power, for evolution ... they will speak, if you will but listen. Are you open to the change you seek? Will you embrace the Turning of the Wheel? The warmth of spring has come early to our section of Western New York and brings with it a sense of renewal and breaking free from the cold, preserving ice. Someone reset the Goddess's alarm clock and we are waking up much sooner than expected. Science tells us that this is not a good thing, and with good reason. Mother Earth's climate is changing. Here at the Albino Bat covenstead we have started to see change come in more positive ways. Seeds that were planted last fall are now beginning to break through the soil and stretch their way to the sun. The warmth of inspiration and the fresh, new growth is riding high, encouraging the sap in older trees to flow more abundantly. Seven years ago, at a time of great upheaval, I leaned my soul shocked, empty shell of a body against a slumbering Oak. The Oak, still and patient, shared with me a small secret of hope. Although the tree looks bare and dead, the stirring of life still remains underground. A reflection of my soul. The strength of my blood. The sap of this Oak. The promise of renewed vitality. Rune of the aurochs, of strength and vigor, and overcoming impossible odds. The Danish have a long tradition of creating moments of comfort to bring an extra touch of contentment to their lives. This practice is a way to combat the cold environment that they live in. I've started including a bit of hygge into my life and have found that it adds a little light to my commonplace chores. I find the love of the gods in this practice. We as witches, pagans and heathens already have a sort of hygge. When we talk about every single act of or day being sacred, this is a form of hygge. My hygge right now lies in Tim Horton's coffee, medium double double, a jasmine scented candle lit over our hearth which reminds me of a Christmas gift that my sister gave me 15 years ago, and our cat sitting on my lap in a favorite blanket. All gifts from the gods, all bringing comfort and contentment. Skol and good health to you! I'm working on writing a public ritual for the Buffalo pagan community. The goddess Frigga is at my side while I prepare this holiday for our guests. As hostess, it is my honor to offer the welcome cup to Brighid. Our home holiday will center around the Aesir and the blessing of our work items by Thor, but our open holiday will be dedicated to the "Fiery Redhead" of martial arts, smithcraft, and creativity. To the Norse people, hospitality was a way of life. No one could be turned away. The table and welcome cup were always full and there was always room for one more in the household; a place for guests coming in from the cold. Odin in His guise as Wanderer, could be the guest who knocked on the door late at night, and who would turn Him away? It was understood that if the guest was treated well, they were to be respectful to the host and the host's family. 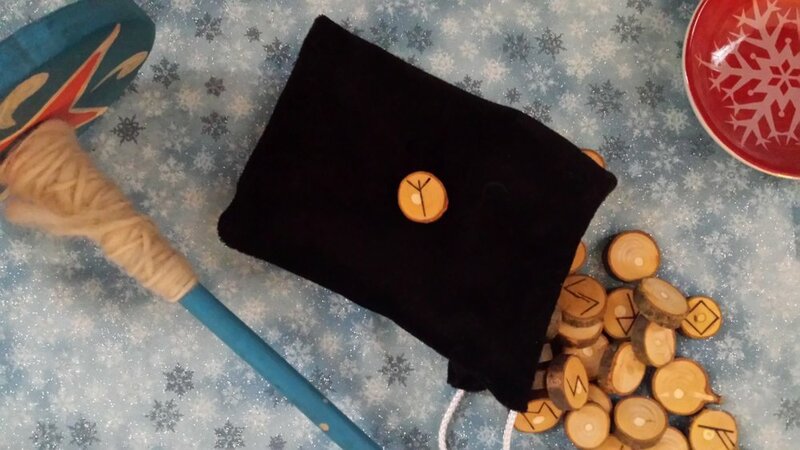 Gebo is the rune of gift exchange and the promise of mutual respect. Exchanging gifts creates an energetic bond between people and families, and can form kinship. I kindle this flame as Sunna gives light to the world. Thor on top of this house, Frigga and Odin at its center and the eight strongest ALGIZ surrounding! When I was a young witch, I fell in love with a prayer to the goddess Brighid. This prayer was said under the breath of the woman who stirred the coals early in the morning to kindle the cooking fire for her family. I used to say it daily as I lit our gas stove to make dinner for my family. When Eldraun and I started building the lesson structure for the clan and chose to work with the Nordic deities, I changed the prayer to reflect our honoring of these gods. Algiz is the seventh rune in the second group of eight runes (called an "aett") in the Elder Futhark. A common use of this rune is for protection. The rune (seen below) can represent the intimidating horns of the Elk or the footprint of the Valkyries in their form of a swan which both relate to warding, consecration and blessedness.